Crake Trees Manor01931 715205work FarmhouseUp the track, over the hill, the view is forever. Crake Trees Manor sometimes limits bookings to 2 or more days. 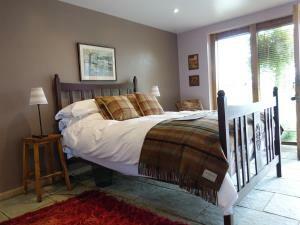 Large and airy with an iron double bed, comfy armchairs and 16th century oak furniture. Mickelbank has a brand new ensuite walk in shower and toilet. Views to the East get the morning sun and also to the North right over the Farm to the Pennines. 1.Mickelbank sometimes limits bookings to 2 or more days. This Bedroom has the choice of being a double or a twin room..
With the original beams that I used to swing from as a young girl while my father and the farm workers were stacking hay bales! This cosy relaxing room has a ensuite brand new low flow Shower with separate Toilet and washroom. A French door open out onto a balcony that is just perfect for catching the evening sunshine. 2.Howebeck sometimes limits bookings to 2 or more days. Peasland Suite has its own private entrance up the outside stairway from the courtyard. With its own balcony to catch the evening sun. 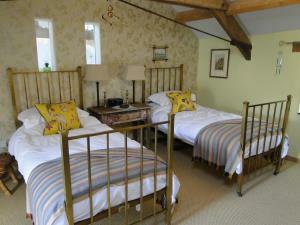 This romantic suite looks over the ancient manor house through the fields and woodland of the farm. The Pennines and Eden valley reach far into the distance. 3.Peasland sometimes limits bookings to 2 or more days. Maud Sleeps 2 in a double bed and has a Ensuite shower with new Low Flow environmental Shower and Private courtyard, perfect for sitting out in the evening sun. 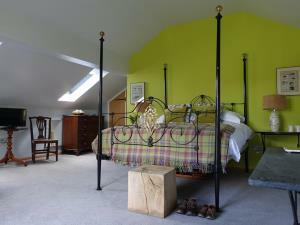 With a quirky mix of antique furnishings, a brand new walk in Shower room and Toilet, tea making and T.V. All guests have access to free WiFi in the public areas. 4G in the courtyard. Maud is a ‘Dog Welcome’ room. 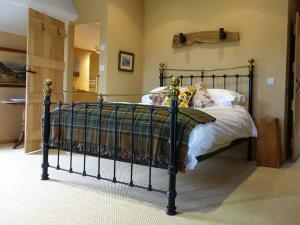 One dog is allowed (by arrangement) to share this room (£15.00 per stay). We have an outside dog shower, dog towels, an enclosed garth where your dog can be off the lead and a small private fenced courtyard that catches all the evening sunshine. 5. Maud sometimes limits bookings to 2 or more days. We had a great stay and were incredibly well looked after. The Tuers are wonderful hosts. The village is great although access to Crake trees is a slight challenge. Internet facility poor but that is not the fault of the house. The room we had was well appointed and comfortable. Up the track, over the hill, the view is forever. Crake Trees Manor is approximately 10 minutes from the M6, jct 38 and the A66, Appleby. Just 3 and a half hours from London if travelling by train. 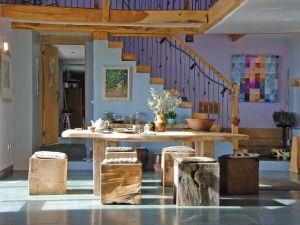 Unique Bed and Breakfast in our modern Barn conversion in the north of The Yorkshire Dales national Park. 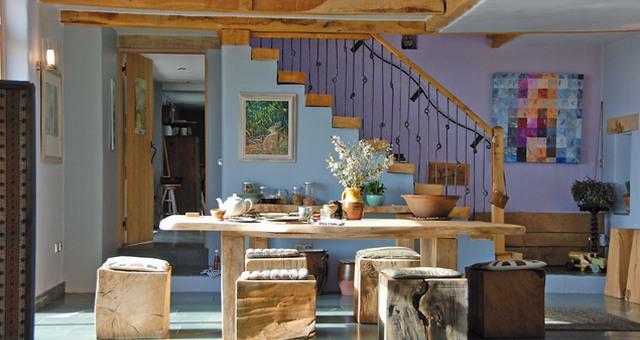 The family Farmhouse has extensive views over the farmland to the Pennines and the Eden Valley beyond. With direct access to many footpaths, we have total seclusion, yet are just 10 mins from the M6 and A66. Five ensuite rooms, one suite, two ground floor dog friendly ensuite rooms and two lovely rooms located in the main house. Lovely breakfasts available, also breakfast basket delivered to your suite. We have Glamping facilities in two Shepherds Huts with exclusive use of a new Stable shower room and shared Stable Kitchen also provide a Camp Site. In addition we provide a cosy Self Catering cottage (The Brew House) in the nearby village of Maulds Meaburn, which is ideal for a couple with a baby and or dog. Children welcome from any age. From M6 jct 38 at Tebay take B6260 for Appleby. Leave B6260 at junction for Crosby Ravensworth, travel down and through village. Crake Trees entrance is 200 metres on the left past the modern village school. our dogs live on site and maybe disturbed & noisy.